Bristolian eDemocracy dudes Delib have published their audit of local authority online consultation offerings across the UK. It’s interesting reading. Personally, I’m still not convinced I really know what proper consultation looks or feels like. 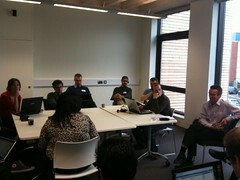 Last Friday saw LocalGovCamp moving to Lincoln for the first of the follow up days. Learning Pool were happy to help out with some sponsorship of the event, which was marvelously organised and convened by Andrew Beeken of Lincoln City Council. The day was an enjoyable one, with plenty of interesting sessions, including one facilitated by Fraser Henderson on ePetitions – an issue I have a professional interest in – and commentable consultations by Joss Winn. Some great write ups of the event have already been posted up by Sarah and Andrew – and I’m sure there will be others. 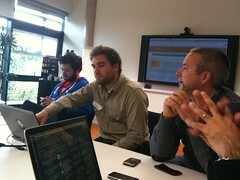 The day was more obviously web focused than the Birmingham event, with many of the attendees coming from web teams. Nothing wrong with that – although the focus at times was more on making local government websites better, rather than making government better. Perhaps the fact that I have never worked on a web team means I’m a little distant from some of these conversations. That the web will play an increasingly important role in the way councils and people interact with one another is a no-brainer. But more interesting to me than how that will work technologically is how it will fit within the culture and processes of local government – or how local government must change to fit with the new ways of working. Another example was the session on hyperlocal blogging and local councils’ relationship with bloggers, which spent quite a bit of time discussing issues of judgements of quality and the need for editing and the relevance of the journalist in a networked society. Again, the real issue for me is the fact that outside the main urban areas, local newspapers are dying out and will continue to do so – and how will this affect the attitude local authorities have towards reputational risk, so much of which is focused not on the needs of the organisation or the people it serves but on what might appear in the local rag the next morning? ePetitions are a good example. How hard is it to build an ePetitions system? Not very. What’s harder, and more interesting, is how you fit those ePetitions into the democratic and governance arrangements of the local authority. I attended one of the Council of the Future sessions at the conference and found it a little unambitious. Indeed most of the things discussed were those that councils should be doing now – that many aren’t needs to be fixed, but it was hardly visionary stuff. I’m really thinking here of things like selling buildings, paperless office, EDRMS, business continuity, remote working, etc etc. In fact, local government will be facing a crisis far worse than the current funding situation, which will be focused on staff and people. Look at the demographics of councillors – where are the next generation of people to take on the role once the current incumbents just get too old? Who will there be left vote for? The problem is the same with officers, if not quite as bleak. There will be a massive churn in the next two years as expensive managers are pensioned off and younger, cheaper people will replace them – assuming those younger and cheaper people exist! Perhaps this is a chance to rethink the roles played by councils and councillors – perhaps the reason why nobody is interested is because the roles are just wrong for this day and age – ties into Will Perrin’s point that government faced 21st century problems, has 21st century technology available to tackle them, but is lumbered with 19th century governance processes – and so no progress is ever made. Who delivers services – should the council be the retailer or the wholesaler of services? How can councils work more closely with the private and third sectors, and community groups, in terms of carrying out its functions? How can the council manage its information assets in a more open way, to encourage reuse by the community and the adding of innovative value that local gov isn’t able to provide itself? How can councils become more entrepreneurial themselves to help bridge the funding gap? How can customer service, communications and service design be blended into an iterative process to help make sure services deliver what users want? What will the role of councillors be when nobody has the time to attend meetings in dusty town halls? Do we need to rethink the way our local democracy works? Perhaps one framework to answer these and other questions might be to consider – if you were to start a council from scratch, right now, how would it work? What would it look like? What would you build first – an office or a website? Am looking forward to these sorts of conversations at future events – and online, of course! A great post from the FCO’s Stephen Hale reveals their digital diplomacy site. There is plenty of good stuff on there, but of particular interest to many will be the social media policy and guidance. Many thanks to Stephen and his team for sharing. I’ve been working with BIS and Becta quite a bit recently on the Learning Revolution project, which is all about improving access to informal adult learning – that is, learning which doesn’t generally mean a qualification. So, stuff like book groups, choirs, yoga classes, basic computer skills. That sort of thing. One part of this project was helping to manage the delivery of a DirectGov hosted website, ably put together by the Dextrous Web team, which provided an interactive calendar and map for the Festival of Learning throughout October. It’s a lovely looking site with a load of interesting features. We also have been running an online community, on good old Ning, for providers of this type of learning to get together and share knowledge and information. But there remains a question over how a national, permanent directory of informal learning might work, and what it would look like. To try and find out, Becta have launched a competition, called Teach us a Lesson. It’s based on Show us a Better Way, and allows ideas to be submitted from anybody. These will be vetted for filth and stupidity, before going live on the site, and other users will be able to comment and rate them. As the ideas flow in, we’ll be organising an unconference in November, to get everyone together to connect and collaborative on ideas that fit well together. After that, the best projects will be judged, with a pot of £25,000 being split amongst up to five projects, so that prototypes can be delivered by March 2010 at the latest. If you have any ideas on how such a directory might work – which could be anything from “I think it ought to be blue!” to “I know the SQL syntax we need to make this work” (I know, I know, I haven’t a clue what I’m talking about…) – then do submit them into the site and be a part of this exciting initiative. As pointed out by Nick. Every two years, EU Ministers gather to agree on a Ministerial Declaration on e-government, which is the main European strategic document. This is usually accompanied by an Industry declaration. We feel the urge to add an open declaration, collaboratively built and endorsed by EU citizens who share the view that the web is transforming our society and our governments. We feel e-government policies in Europe could learn from the open, meritocratic, transparent and user-driven culture of the web. We also feel that current web citizens should engage more positively with government to help designing a strategy which is genuinely difficult to adopt in the traditional culture of public administration. We trust that if we manage to deliver quality of insight and quantity of endorsement, we will present this declaration officially at the EU ministerial conference on e-government, in Malmo on November 2009. The open declaration is being collaboratively edited using the MixedInk tool, which to my shame I am yet to have a proper play with. Check out the blog, and the Google Group too. I’ll be keeping my eye on this, a potentially really interesting initiative. So, the announcement has been made, and the new Director of Digital Engagement is Andrew Stott. Andrew is currently Government Deputy Chief Information Officer. He has had director-level oversight within the Cabinet Office for the Power of Information work from its inception and was a member of the Minister for Digital Engagement’s Power of Information Taskforce. The reaction to the appointment has been mixed, some pleased that a guy with clear ability at driving stuff through government has the job; others less pleased that the director isn’t someone from outside the Whitehall bubble. However another insider confirmed to me privately that the real reason Stott may have the appointment is simply that strong candidates from outside Whitehall with web 2.0 experience didn’t apply. There’s…general (but for the record, not universal) consensus that Stott will be a ‘safe pair of hands’. Of course he meets the criteria of having ‘the authority to be credible with Ministers and senior officials’ and ‘experience of the workings of Government’. But there’s little evidence – and I stress, evidence – of his fit with some of the other supposedly essential criteria. If he has ‘run a public facing web site of significant size’, or ‘innovated in web, beyond web publishing’, the web itself doesn’t have much information about it. To be honest, I rather thought that this would be given to some super clever bod from outside government, who would come at the job with a wealth of experience, challenging ideas and determination to ‘make stuff happen’. Then, as so often happened before, said person would begin to flag in the face of the enormity of the expectations of the job, burned out within a year to 18 months and left to go and do something else, broken. Well… that won’t happen now; so this job that seemed a bit of a ‘nod in the right direction, but basically impossible’ is actually not that at all. If they wanted it to be that, they would not have appointed Andrew. My first thoughts are the most obvious. 1. Join the conversation. Assuming Andrew want’s to engage with us, take the time to give him useful help. 2. Offer him a mentor or two? Is that cheeky? I hope not. Who would be ripe for that role? 3. Make sure he knows he’s surrounded by a substantial community that wants POIT to succeed. I think many – including myself, if I’m honest – expected a new face from the private sector to make a bold splash and shake everything up. Which, to be honest, wasn’t a very appealing prospect to those of us who have been plugging away at this for a while now and thinking that we were finally getting some real progress on many fronts. To suddenly change direction and start all over again would have been both irritating and time-consuming, just when there is no time to waste. This appointment means we should be able to get on with things, but with a high profile person at the head of things to drive it forward still faster. I’ll be watching the Digital Engagement blog (why didn’t they just use this one? 😉 ) and Twitter feed to find out what the new Director will be doing. My advice would be to seize the initiative, set out some small but important things to achieve and make them happen, to get the doubters back onside as soon as possible. More views, one very positive from Harry, and another from Neil.